For Honor is an unusual prospect for Ubisoft, as indeed it would be for any major publisher. A medieval melee combat game focusing on multiplayer, there's more Chivalry than Call of Duty in its DNA. It's best understood as a product of the same change in attitude that brought us Rainbow 6: Siege. They're very different games, but they have a shared intensity of focus—something that separates them from the jack-of-all-trades open-world adventure games that Ubi has become associated with over the last couple of years. Like Siege, For Honor provides a well-rounded simulation of a very specific combat fantasy. You've got to approach this game with an enthusiasm for swordplay and a fighting game player's willingness to practice. Combat plays out differently for each class, which are divided between light, heavy and medium fighters across three factions—vikings, knights and samurai. Even so, the basic principles of the same: you lock on to a target and adjust the angle of your blade in three directions. You can block, parry, and pull opponents into guard breaks and jabs. When you start playing, it's often enough to spam light attack and pick on wounded or outnumbered foes. As you get better—or when you try your hand at one-on-one duels—you need to learn how to match your approach to the situation and your opponent's class and playstyle. It's a lot like a fighting game in that regard, with depth and the potential for real mastery. The matches you play online will contribute to the progress of your chosen faction in a world-map-spanning metagame. Somewhat confusingly, your choice of faction doesn't limit you to one set of characters in-game: you can declare your allegiance to the knights overall, but play a viking in every game if you want to. Control of territory changes the way maps look, from the banners that hang from castle walls to the time of day and season. The metagame is played in seasons, and your participation in a given season will be rewarded with unique cosmetic rewards. Like Rainbow 6: Siege, For Honor's microtransactions will be restricted to these kinds of cosmetics—all future maps and character classes will be free. I had a chance to try a couple of new character classes at a recent Ubisoft event in Paris. The peacekeeper is the knight's light skirmisher, a hooded dual-wielder whose speed makes her an ideal objective-capper. The shugoki is a massive samurai armed with a heavy club whose powerful strikes and durability make him a dangerous frontliner. I liked For Honor in the alpha but it was these rounds of Elimination that really sold me on the game. Unlike other modes of this type, your team doesn't spawn together. Instead, you're paired off with a member of the enemy team at random. This creates a really exciting strategic element. If you fancy your chances in a one-on-one duel, and you can win it solo, then you've just put your team at a substantial advantage early in the round. You're also free to run away and help a teammate, if you prefer—but doing so frees up your opponent to either chase you or rush off to outnumber one of your allies. It's a genuinely interesting dilemma, one that rewards knowledge of matchups and punishes over-confidence. That said, winning your initial pairing and being able to rush off to save a teammate is a great feeling. This mode also helped me come to understand a little more about For Honor's underlying design. In one early round, we faced an enemy team that picked exclusively light attackers and we got destroyed. The ability to spam rapid light attacks and stunlock opponents is very powerful, particularly when players are new and don't know how to deal with it. Expect much wailing and gnashing of teeth about exactly this when the game launches. The downside of killing somebody with light attacks, however, is that this puts them into a down-but-not-out state and (rather counter-intuitively) they can't be executed when they're on the ground. In Elimination's wide open maps, there are lots of opportunities for somebody to escape the battle, run off and revive their teammates, and reset the match. Light attack spam might win you the duel, but it also condemns you to babysitting the body of the person you just beat. If you take somebody out with a more-difficult-to-land heavy strike, however, you can chain this into an execution finisher that means your opponent can't be revived (typically because they no longer have a head.) This is a much bigger deal in Elimination than it is in Dominion, and when we faced that team again—and they picked all light attackers again—we took it more patiently, waited for the right moment to strike, and were sure to finish off our opponents with an execution if at all possible. Even if only half of our team won their duels, the difference is that our teammates had merely been downed by light attacks where theirs had been decapitated. This gave us map control and allowed us to completely dominate the next set. This is exactly the kind of strategic layer that I love and it confirms that I'll play For Honor when it comes out next year. That said, I wouldn't underestimate how much more fun these matches were because I was playing with friends with voice chat. As with most competitive team games, solo play will lose a lot of this depth and likely won't be as fun. Rainbow 6: Siege is another good comparison, in that regard: expect salty behaviour when you play on your own and brilliant fun if you've got a full team of friends. Speaking of solo: the singleplayer campaign is the weakest aspect of For Honor, or at least the portion that I've tried. I played one mission as Mercy, a peacekeeper infiltrating a viking stronghold under the cover of darkness. This boiled down to a series of one-and-one and group encounters on cliffside paths and ultimately in the stronghold itself. Stealth didn't seem to be viable and there were few alternate routes. It was enjoyable as a showcase for the game's melee combat system, but didn't offer much depth beyond that. The next mission, the first in the viking campaign, took place in an open environment—a village with multiple objectives to complete—and provided a few more dynamic moments. In one instance I blocked an incoming blow, countered with an armour break, and kicked my opponent into a flaming brazier which toppled onto a nearby hut, burning it down and stopping the flow of reinforcements. It was a cool moment, but relied on systems specific to that particular mission. 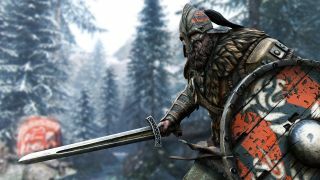 For Honor's environments are not reactive in that way as a general rule. The mission concluded with an on-rails horseback chase sequence drawn straight from the middling action-adventure playbook. I dodged debris and swung my axe left and right to unseat riders attacking from the sides. You have done this sort of thing before. There are mini-campaigns for each faction, and you'll play as several different characters (read: multiplayer character classes) over the course of each. The enemies you fight are, likewise, drawn directly from the pool of online character archetypes. This makes singleplayer a decent way to get to grips with the various matchups you'll face online, but I can't see it being a draw in its own right. It's best thought of as the equivalent of a fighting game's story mode: nice to have, but not the main event and probably not worth the price of entry on its own. I'm excited to spend more time with For Honor's multiplayer, however, and I can see myself investing hours in it on release. After all, I'm squarely in the middle of the target audience: I spent a substantial portion of 2014 trying to master Blade Symphony. Swordfighting games are my jam. I'm curious to discover how big the audience for them really is, however: this is a niche, after all, and even in the era of Game of Thrones it's less marketable than a shooter. I wouldn't be surprised if For Honor was a slow burner, starting life with a small passionate audience with the potential to grow from there if it receives the right support. I hope it does—it's always good to see originality rewarded. Now, per tradition, I will conclude this preview with a gif of me kicking Eurogamer's Chris Bratt off a cliff. In the name of journalistic integrity, however, I should also disclose that not long after this he also kicked me off a cliff. He is the better Chris and I am sorry.